Square brownies are great and all, but they are so, well… square. So, you’re chomping happily along, and before you know it you reach the end of an edge. The problem? Too many corners. The answer? More edge, in the shape of a wedge. Eliminating the spectre of all-corner brownies, the Brownie Wedge Pan by Nordic Ware, loses one of the four corners and makes it all edge. 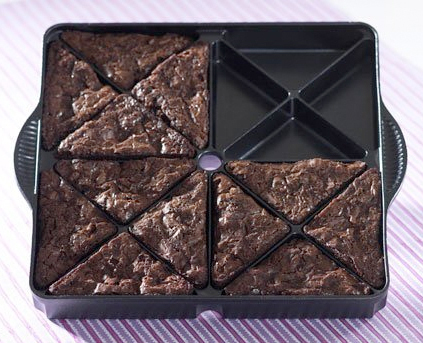 Sure, you could just cut a square brownie diagonally, but then that wouldn’t be a real brownie edge, and with brownies, it’s all about the edge. And with sixteen edge-heavy wedges per batch, the wedge pan has an edge over the competition.